The wheel never stops turning here at NWTT, but the last few weeks and months have been especially hectic, not only have we been building up to our peak season, but lots has been happening behind the scenes that will shape the future of the company. Pictured left to right: Jennifer Bell (Forbes Solicitors), Andrew Gleave (Yorkshire Bank), Roger Mayor, and Paul Bennett. Chief of which is the exciting news that our Director Roger Mayor has bought out his brothers and fellow directors Henry, Andrew and Robert to become full owner of North West Timber Treatments. 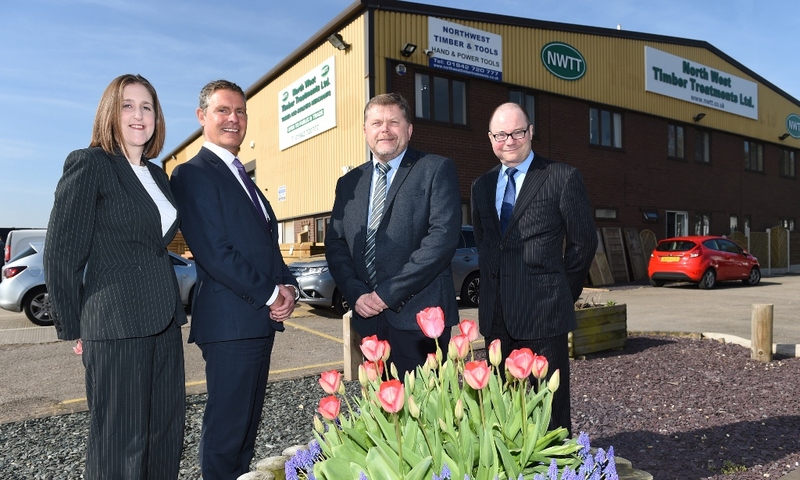 Roger has steered the NWTT ship since it's birth over 25 years ago, and his knowledge and drive have shaped the company into what it is today, boasting 4 depots and over £10 million in annual turnover. "This was a particularly complex deal, made to run smoothly by having the right calibre of professionals around me. I am looking forward to building on my existing business and when it comes to future expansion I know that I have the right people in house and externally to help me." This deal can only mean good things for NWTT and our customers, as Roger will now undoubtedly want to push the company to bigger and better heights, and drive and direct NWTT like never before.